An ion engine in ground testing. Japanese engineers have devised a plan to combine parts fromtwo partially-failed ion engines to resume the Hayabusa asteroid probe'sjourney back to Earth. In a press release Thursday, officials said they will usethe neutralizer of Thruster A and the ion source of Thruster B to provideenough power to guide the 950-pound spacecrafthome next June. Hayabusa launched in 2003 with four ion engines. Thruster Awas shut down due to instability shortly after launch, while Thruster B wasturned off after high voltage in its neutralization system. Thruster C was manually switched off after signs it might bedamaged by high electrical currents, and Thruster D failed two weeksago due to a voltage spike. The Nov. 4 glitch left Hayabusa without a propulsion systemand put its scheduled return to Earth in serious doubt. But the new plan givesJapanese officials new hope. "While the operation still needs monitored carefully,the project team has concluded the spacecraft can maintain the current returncruise schedule back to the Earth around June of 2010, if the new enginesconfiguration continues to work as planned," the Japan AerospaceExploration Agency said in a statement. 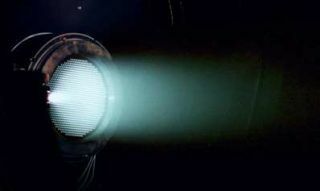 Hayabusa's four experimental microwave discharge ion enginesconsume xenon gas and expel the ionized propellant at high speeds to producethrust. Ion engines are more efficient than conventional chemical thrustersbecause they use less fuel and can operate continuously for thousands of hours. The craft's thrusters have accumulated almost 40,000 hoursof burn time since theprobe launched. Plans call for the spacecraft to continue thrusting untilMarch, when it will shut down the ion system and coast toward Earth for aparachuted landing in Australia. Hayabusa spent three months exploring asteroidItokawa in late 2005. The probe took 1,600 pictures and collected about120,000 pieces of near-infrared spectral data and 15,000 data points with itsX-ray spectrometer to investigate the small potato-shaped asteroid's surfacecomposition. The spacecraft approached Itokawa several times, attemptingto fire a pellet into the asteroid's surface and retrieve rock samples througha funnel leading to a collection chamber. During a failed sampling attempt in November 2005, Hayabusamade an unplanned landing and spent up to a half-hour on Itokawa, becoming thefirst spacecraft to take off from an asteroid. Although telemetry showed Hayabusa likely did not fire itsprojectile while on the surface, scientists were hopeful bits of dust orpebbles found their way through the funnel and into the sample retrievalsystem. Hayabusa was later stymied by a fuel leak and groundcontrollers temporarily lost communications with the spacecraft, which is aboutthe size of an average refrigerator. Controllers labored to overcome the issues, which werecompounded by the loss of two orientation-controlling reaction wheels and powercells in an electrical battery. The craft's departure from Itokawa was delayed a yearbecause of the problems, postponing its returnto Earth from 2007 until 2010.